Reflections: Come join the Blog-a-Ton! After playing hide and seek for about 3 weeks, it seems the monsoons have finally relented. It has been raining abundantly since the night and it definitely looks promising for the North-Western Region of India. I hope it continues like that. Anyway coming back to my topic, I'll like to introduce you to my new initiative, Blog-a-Ton. As some of you might have noticed, I have created this new blog. So what is Blog-a-Ton? Blog-a-Ton is a misnomer for the word Blogathon. 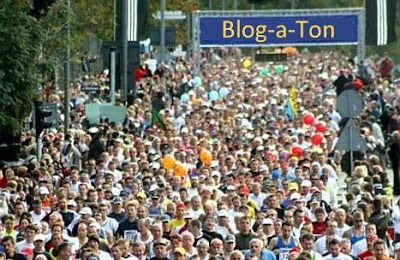 The idea of holding a Blogathon, simply put a marathon of bloggers, came to my mind when I didn't even know that such a word exists. 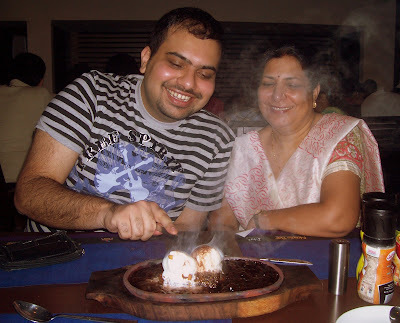 So, I invited bloggers through IndiBlogger Forum to participate in the first edition of a Blogathon, few weeks back. We'll choose a day and a topic to blog on. On that day we all will write a post on our blog on the given topic. After the write-up, we will include the links to the write-ups of fellow blogathon participants. This will not only help us in making new friends in blogging world but also give us a lot of backlinks. It was Arjuna, an interested participant who came up with the idea of renaming the event for the want of uniqueness and starting a blog for the same. I believe these were great suggestions and so was born Blog-a-Ton. This new Blog is going to be an efficient way of reaching out to the prospective bloggers and develop an online community at the same time. And as the new name suggests, our Mission is to conduct a Blog-a-Ton where 100 bloggers will take part together. This ambitious mission can become a reality only with the help of my Blogging Buddies. So if you think, this effort is worth it, come join the Blog-a-Ton (http://blog-a-ton.blogspot.com/). As already mentioned, discussion for holding Blog-a-Ton 1 was initiated on Indiblogger forums and later on shifted to the new Blog. Of the various topics suggested by the interested participants, the following three got the maximum votes (ironically, just two each). Of these the first one, was suggested by me and seconded by my fellow team member Arjun, based on the tagline of Indiblogger. You may help in pruning down the list to just one final topic by voting for any one out of these three in the comments section of the related Blog-a-Ton post. I have also created this Blog widget to popularise and spread the Blog-a-Ton community. You may add it to your blog by following the instructions given in the following Scribd Window. For choosing the desired text, choose the Text Selection mode (denoted by an I) from the drop down menu (downward pointing arrowhead), second from the right on the toolbar of the Window. In case, the Scribd Window takes time to load, here is the HTML code for the Blog-a-Ton widget. Just replace the square brackets [ ] with the tag brackets < > within the code. If the button is too large for your blog, then just reduce the number highlighted in red. In order to keep yourself updated of all the activities happening in the Blog-a-Ton community, visit and start following the Blog. 1. In the absence of a cake, making things work with a tiny but yummy Dimsum at the Noodle Bar. 2. Finally cutting something related to cake family, my favourite Brownie Sizzler. Blame it on my poor English skills or equally stubborn brain cells, I didn't understand a thing about blog-a-ton!. And I will sure take part in it whatever it is, for YOU! Btw, I posted a new poem on my blog! hey pawan, the idea is simple. On 25th july, we'll be declaring a topic. Every Blog-a-Ton member will have a week to write a post on it. On Aug 1, evryone will publish tht post on their blog nd leave the link 2 their post in d comments section of the post tht i will create for this purpose. By the night or d nxt day, i'll collect all d links nd create a html code, with names of the members linking 2 their posts. All mmbrs just have to copy it nd paste it at the end of their posts. And for you, I'll 'try' to write my next poem in proper english! I started following blog a ton already, did I? If not ill do it right now! Man...this Scribd thingie doesn't seem to open on my machine... any other ways!! I am already a member. But I am not able to see the HTML code now. @Bharathi.. the scribd window might take time 2 upload on slow net connections.here is the code.. just replace ( and ) with < and > respectively. nd yeah, thnx 4 adding the widget, bt thr seems sum pblm on ur blog as d image is not appearing.